East Coast Metal Systems, Inc. (ECMS) is a full-service fabricator and installer of engineered architectural metal and exterior envelope systems. Its fabrication shop utilizes state-of-the-art technology to minimize lead times and deliver projects on time, on budget and within specified tolerances. The company provides a full-service estimating team to assist architects and designers. East Coast Metal Systems currently operates fabrication shops totaling 40,000-square feet in Bellaire, Ohio, and Wheeling, W. Va., however both shops will be consolidated in a new 60,000-square foot facility in Triadelphia, W. Va., in late 2016. The company purchased its first PANELBuilder System manufactured by AXYZ in 2006 and a second PANELBuilder System in 2009. PANELBuilder, a CNC router with a user-friendly software system, is designed to process large volumes of cladding material quickly and efficiently. 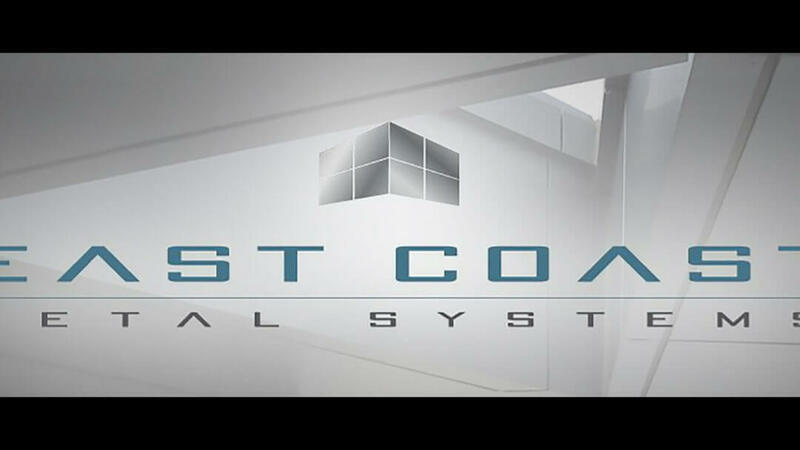 In 2013, East Coast Metal Systems upgraded its PANELBuilder machines and plans a further upgrade to the newest version in the near future. ECMS has been providing fabrication services since 1990. According to John Trifonoff, ECMS vice president, the company found a market and a need for composite panels, which it began producing in 2001. “We had to set up our processes at the time, and we were still learning,” Trifonoff said. The company had been using an AutoCAD system, which would create a file for each panel and a machine would cut it. At the time, ECMS had to rely on an outside program such as Toolpath to cut groups of panels, which slowed down the process. Trifonoff said workers had to nest each individual file. When orders substantially increased by 2003, the company recognized that the current method was insufficient. The existing procedure also had an occasional negative impact on estimating. “Our estimator tried to get the best yield he could, but it wasn’t very easy,” Trifonoff said. The company knew it needed the right technology to improve the accuracy of the estimating process as well as the ability to perform group panel cutting and customized work required by its growing customer base. Trifonoff recognized ECMS growth would be significantly aided by the purchase and use of a CNC router with all of its technological enhancements. What he needed was a company that would be more than just a supplier of a sophisticated router. East Coast Metal Services wanted a partner. ECMS began its due diligence by researching carefully, attending industry trade shows and asking the right questions. Their discovery process led them to AXYZ. “They are the leader and we were new at it,” Trifonoff said, “and we found that they were on the same path of doing the same things we were.” Another factor that impressed ECMS was AXYZ’s continuing development and ongoing technological enhancement of their CNC routers. “We wanted someone to be out in front, develop with us, help grow our skills and keep up with technology,” Trifonoff said. One of the stand-out values that ECMS found as it researched and discussed its needs with AXYZ representatives was the innate understanding of East Coast Metal Services goals and the processes that would be necessary to achieve them. “You could tell they knew what they were talking about, and we had a comfort level with them,” Trifonoff said. After weighing all of its options, ECMS chose AXYZ PANELBuilder. It has been utilizing the system and its upgrades ever since. East Coast Metal Systems chose PANELBuilder because the system has been recognized by AXYZ customers like ECMS as the most sophisticated, all-in-one solution for today’s market. The system capabilities and efficiencies for processing cladding materials begin with a custom machine-designed CNC router that works in combination with an easy-to-learn and use software system. It is designed to process composites and other materials consistently, quickly, efficiently and at lower cost. Among the materials that are easily cut by the AXYZ CNC router include stainless composite material, titanium, copper, solid aluminum and high-pressure laminates. The software for PANELBuilder operates in 2D and 3D enabling users like EMCS to build an actual library of panels through the built-in drawing package or by importing existing drawings. The software then generates automatic toolpaths for panel cutting. PANELBuilder, along with AXYZ CNC routers, offers dual and triple-head configuration—a highly efficient and cost effective way of processing jobs requiring two or three different tools. ECMS likes the features of the PANELBuilder software, in particular, its traceability functions. “It’s how we track and input the programs so the workers can be sure they’re cutting the panels as they need to be cut from start and finish,” Trifonoff said. Another feature that is especially important for the company is nesting. Panels can be grouped and meshed to maximize material use. The process is made possible by PANELBuilder’s nesting algorithm that can utilize simple or complex panel geometry to create more efficiency and speed of production. Projects can be drawn in AutoCAD, placed in PANELBuilder and sent to the CNC router. Trifonoff said previously time-consuming projects are being completed in half the time. The initial setup took only one day and Trifonoff said that after just a few days of training, workers were able to easily import and export programs. Ongoing training, maintenance and technical support either remotely or on-site are part and parcel of the ECMS/AXYZ partnership. Trifonoff said that AXYZ and PANELBuilder continue to deliver in three crucial areas: accurate cutting and material yield, efficiency and lowering production costs, which “allows us to be more competitive, offer the best price for our customers and get a maximum return.” He added that the partnership with AXYZ has aided in the company’s growth that has facilitated its upcoming expansion.